Vinyl = Marine grade white or any color vinyl . C.O.M = Customer own materials. Customer specified leather and fabrics are priced on request. Helm chair and all weather covers (marine grade canvas) are available and charged separately. All prices and specifications are subject to change without notice. All shipping charges, duties, forwarding, taxes, etc. to be paid by customer. We reserve the right to incorporate our latest features on all products under order. All prices and specifications of products shown in this on-line catalog are subject to change without notice. We carefully inspect all merchandise prior to shipment. Your order should be checked immediately upon arrival for damages or short shipment even though it may not be needed at that time. All problems must be made in writing and received by SEA FURNITURE / SEAFURNITURE.COM within 24 hours after receipt of merchandise. If a shipment is received in a damaged condition, a claim must be filed with the delivery carrier and noted on the freight bill before you accept merchandise. Delay could make any claim impossible. All boxes and packing materials must be saved for inspection in the event a warranty or freight claim is necessary. Since each product is uniquely handcrafted just for you, 100% payment is required before your order enters production. All sales are final. There is no refund. Sea Furniture offers a limited warranty on all products it manufactures for a period of one year from the date of shipment from it's factory. ( refurbished items have a limited 90 days warranty ) This warranty covers the repair or replacement at Sea Furniture option, of any product proven to be defective in workmanship or materials. All products must be returned to our factory (at owner's expense) for evaluation prior to any claim approval. No warranty claims will be considered for products with unauthorized modifications, inappropriate use, or signs of abuse or improper maintance and care. Transportation costs are the responsibility of the purchaser. Work performed using customer's own material has no warranty. This warranty is in lieu of any other warranty expressed or implied. 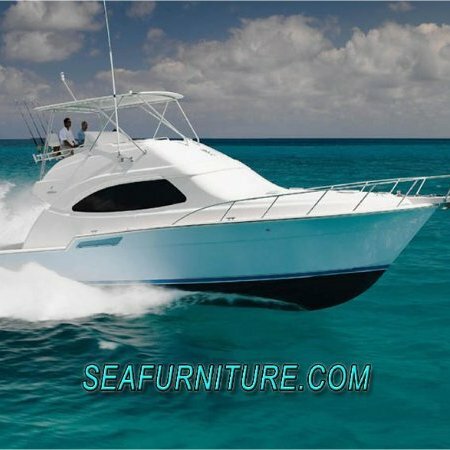 Foam cushions made for customers boat is considered custom order and can not be returened. All Helm Chairs are considered custom ordered and can not be returned or refunded. Helm chairs made by sea furniture are not garanteed to work or fit customers existing or customer's purchased slider-sprider or pedestal. Foam cushion regardless of material used to manufacture can not be made wrinkle free or %100 perfect. If complains are made regarding foam cushions we will re-work the cushions with customers request but will not constitued allowences or refunds. Returns : There Are No Returns on Custom Orders. Returns are only for our Stock Items. Stock Pedestals have a %35 Re-Stocking Fee. Customer will Pay for Return Shipping Costs. Any Federal or State Excise or Sale Tax for which we may be liable for on any sales will be charged to and paid by the buyer. Buyer is responsible for furnishing tax exempt or resale certificates if applicable. Customer is responsible for International shipments custom's tax and fees. %3-5 fee is added to invoices paid by Visa or Master Card. Copyright 2011 Sea Furniture Sea Marine Hardware. All rights reserved.